Video surveillance systems. Boasting the highest quality and latest technology, we provide the entrepreneur with the perfect solution to ensure peace of mind. Advanced Utilities has earned a strong reputation in supporting the products we sell with the best installation, technical support and customer service in the industry. PROVISIONS products, systems and accessories meet and exceed the highest standards providing a new level in surveillance monitoring with a clarity you have never imagined possible. 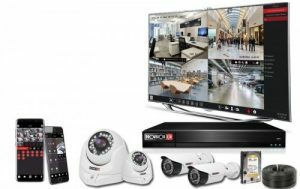 In addition to superior image quality our products implement the latest video processing technology and exceptional advanced features including digital image balancing, excellent picture display in all lighting environments, WDR capabilities, privacy masking and advanced noise reduction. Our products are compatible across all browsers including IE, Safari, Chrome and Firefox. All major devices such as mobiles and tablets, using both Windows and Mac OS X operating systems are also fully functional. Due to the outstanding quality of our products we are proud to support our customers with a long warranty period of 3 years.